Locals seem to enjoy taking part in the parade! 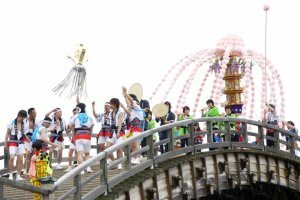 Every year on April 29 (a National Holiday commemorating the birthday of the Showa Emperor, Hirohito) the Kintai-kyo Bridge Festival is held in Iwakuni. 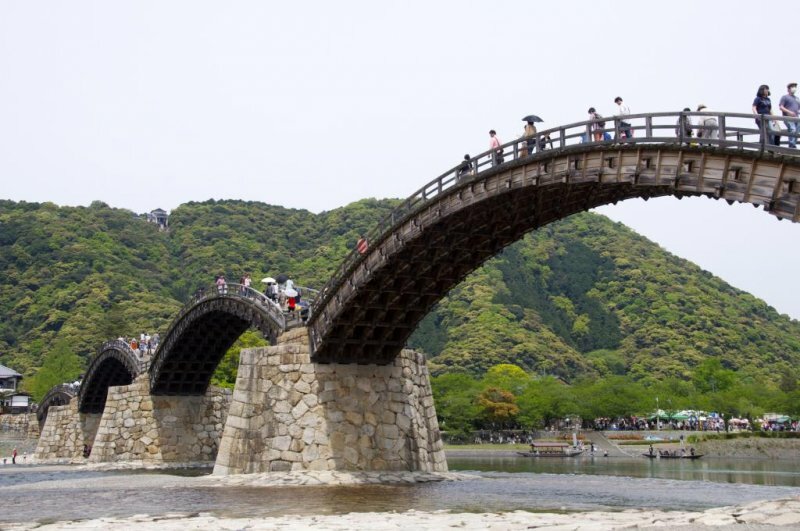 Centered around the iconic and beautiful five-span arched Kintai-kyo Bridge which lies below Iwakuni Castle, the event attracts large numbers of people and is a fun day out. Kintaikyo Bridge is worth visiting at any time of year, and if you want to have the bridge all to yourself, festival days are not the time to go. The atmosphere, stalls, performances, and even the crowds, during this festival, however, make for a great experience. The focus of the event is a parade over the bridge made of up of groups of people in period dress. One of the Tokugawa Shogunate’s more ingenious means of controlling its powerful vassals was the institution of sankin koutai which required local lords (daimyo) to spend every alternate year in the capital, Edo. 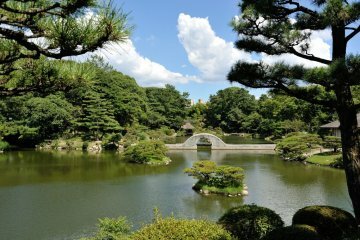 Over time a culture of one upsmanship developed as daimyo would, a great financial cost, vie to outdo each other in the magnificence of their progresses. 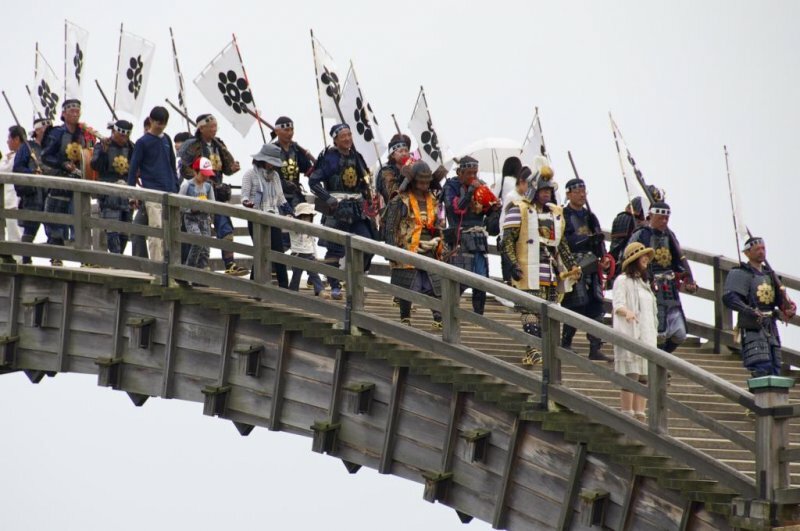 The parade is a reenactment of the return of the local daimyo with his entourage from the capital. Over a two and a half hour period, starting just after 1pm, various groups make their way over the five arches of the bridge, some performing elaborate and dexterous moves. 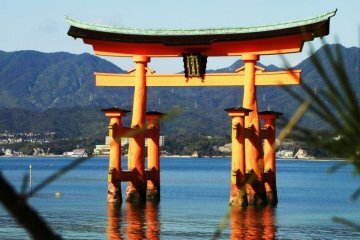 The procession culminates with the daimyo, the highest ranking vassals and women dressed in beautifully colored kimono. Look closely and you’ll notice that some of these participants look a bit different from the rest of the paraders; they are from the local US marine base which is located in Iwakuni. 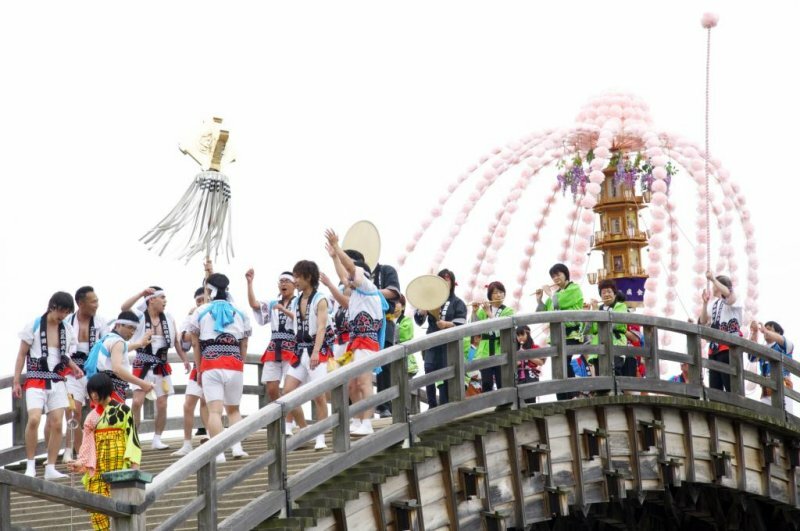 The whole thing is slow moving, but, as the bridge is closed to the public during the procession, it is a great sight evocative of woodblock prints of the time. While the parade is in progress, a troupe of volunteers dressed in samurai armor give a demonstration of 17th Century gunplay on the riverside using antique weapons. As the bridge is closed to the public during the parade, it makes sense to choose your viewing point well before it starts. 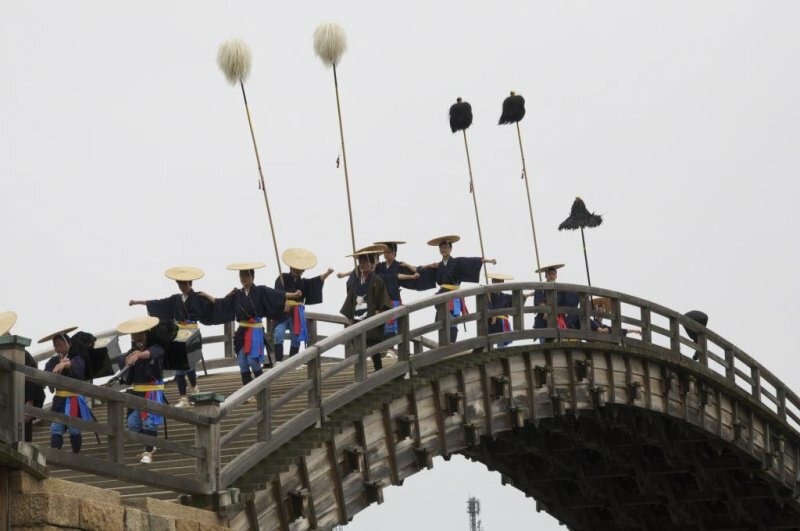 The parade reenacts the return of the daimyo, so comes over the bridge towards the park that lies below Iwakuni Castle. The firearms display, however, is on the other side of the river, near where the festival goers park their cars. We snagged a space on the riverbank just to the side of the castle-side end of the bridge: this allowed us to see the parade as it went over the high arches, and the kids could paddle in the river below. We also had easy access to food and drink stalls, as well as to a toilet. We didn’t get a great view of the firearms display on the other side of the river, but could “kind of” see it - we definitely heard it! 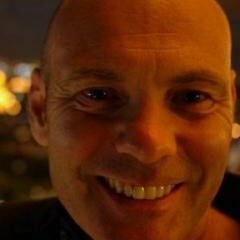 As well all the usual festival stalls selling tasty stuff to eat, including places to buy Iwakuni’s own version of pressed “box sushi” (which predates the Tokyo-style nigiri-zushi that predominates today) and Iwakuni lotus root (renkon), you can drink Japanese tea served by ladies in kimono in a pleasant tea garden, and wander around one of the largest flea markets in the region which spreads along the bank of the river. If you are lucky, some of the cherry blossoms (which are stunning here) may still be around, but even if they are not, in good weather this festival makes for an excellent day out. The parade makes the photogenic bridge even more glorious to capture, it seems!